If brilliant, red-orange tubular flowers light up your backyard in May or June, you might have crocosmia corms planted in your garden. Also known as the Lucifer plant, Crocosmia 'Lucifer' is the most popular type of crocosmia, with dramatic blossoms that make excellent cut flowers. The plants grow from bulb-like corms and look best in grouped plantings of 10 or more. Caring for crocosmia is easy if it is planted appropriately. Who would think, looking at the small crocosmia bulbs, that they would produce such grandeur? First come the arching, three-foot high flower stems with lance-like leaves. 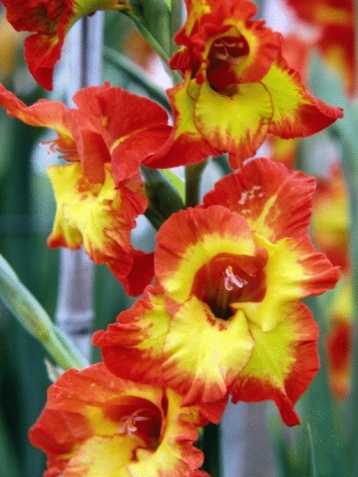 After that, the buds open into a superb display of thin, trumpet flowers in scarlet. They attract every eye, including the darting eyes of hummingbirds that arrive out of nowhere to sip. The flowers appear in late spring or early summer. Many gardeners plant the bulbs in a scattered groupings to create a drift of color. The blossoms will last for weeks if you leave them on the stems, but they are also durable and attractive as cut flowers. Crocosmia bulbs are actually corms, not bulbs. They look like bulbs and act like bulbs too, storing energy and nutrients to power the growth of the plant. But bulbs are layered like onions, while corms are solid and all of a piece. Crocosmia are hardy in U.S. Department of Agriculture plant hardiness zones 5 through 9. That means that if you live in one of these mild weather zones, you can plant crocosmia corms and leave them in the ground. 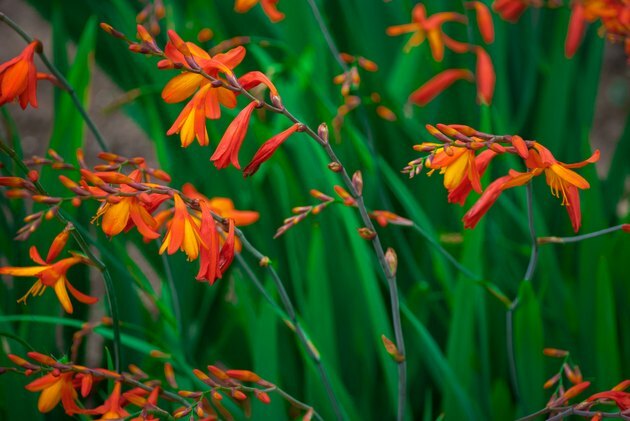 In other areas, grow crocosmia as annuals, digging them up in winter. To plant crocosmia corms, wait until spring after the final frost of the season. They won't grow until the soil is warm, so there's no point in putting them in the ground too early. Prepare the soil by cultivating it well. It should be moist, well-drained soil in an area with sun. If your region is very hot, select a bed that gets some shade during the afternoon. If you live in USDA hardiness zone 5, select a bed that is protected from winds, and mulch well in winter if you intend to leave the corms in place. Plant the corms about 3 to 4 inches deep and about 6 inches apart. Be sure that the pointy end is facing up. Water the planting area thoroughly so that the earth settles in around the corms. You won't have to wait more than a few weeks to see sprouts start growing, and roots will be growing under the ground at the same time. Once the plants come into flower, snip off a few to decorate the house. When the flowers start to fade for the season, don't automatically chop down the plants. First, deadhead the plants so that they do not invest precious energy in producing seeds. You want that energy to go into recharging the bulb with nutrients and energy for the next growing season. Continue to water the plants after you have removed the faded blossoms until all foliage is yellow. For USDA zone 5 gardeners and those in chillier areas, you can still grow Lucifer plants as long as you are willing to dig out the corms and keep them inside during winter. Use a small shovel or garden fork to dig them up in autumn after the plant stems and leaves have died back. Take care not to puncture or wound the corms. Wrap the corms in newspaper or store them in a dry medium over winter in the garage or basement. When spring comes round and the soil warms again, replant your crocosmia.